Basically a GUI for people who are too lazy to do it via Group Policy... sweet! System administrators do not only have to make sure that the computer systems that they administrate are protected from online threats: Local attacks are also a common threat that has to be dealt with. One prominent way of gaining access to a local computer system is by connecting external devices to the system. USB ports have to be protected by the system administrator so that external devices cannot be connected to the system. Some of the dangers are malware threats that could be distributed in a computer network from one entry point or data theft by copying data from the local system to a removable device. USB Blocker (via Techie Buzz) is a software program that can protect USB ports from being accessed unauthorized. One main benefit of USB Blocker is that it relies solely on group policy mechanisms and does not have to be deployed on client computer systems. USB port protection can be achieved with just a few mouse clicks on connected computer systems. The application is controlled via a small interface that pops up for the first time after installation. 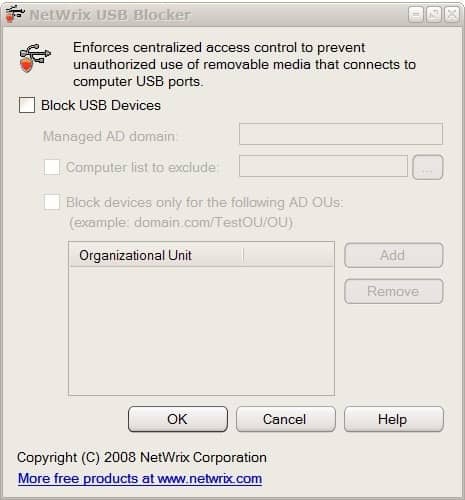 A click on the Block USB Devices checkbox enables the options for managed active directory domains and provides the means to exclude computers from being blocked by the USB port protection software. There is also an option to only block devices for specific organizational units in the Active directory. The usb port protection software can only be downloaded after a quick registration (without verification) at the website of the developer. USB Blocker is compatible with most Microsoft operating systems. A commercial version exists as well which extends the functionality of the USB port protection to include additional devices among other things. March 5, 2009 by Ben Pike.